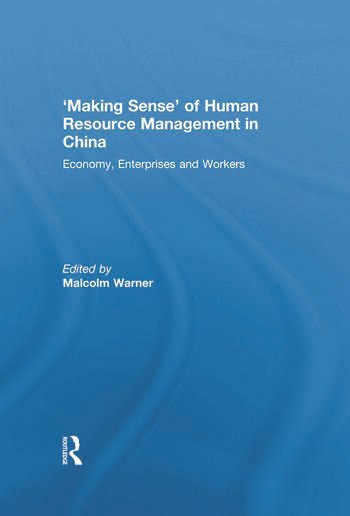 This edited work attempts to ‘make sense’ of recent developments in the field of Human Resource Management in the People’s Republic of China. It attempts to see how the paradoxes and contradictions engendered by contemporary Chinese society are being resolved in the enterprises and workplaces of the Middle Kingdom. The book starts with an overview of the literature, then follows with a selection of micro-oriented, concerned with topics like recruitment and retention, then macro-oriented empirical studies, a number of the latter dealing with strategic as well as performance issues, with last, those comparing sets of societal cultural values. It attempts a synthesis of what has emerged from recent research on the ‘harmonious society’. These contributions from authors based in universities in eight countries, in Australia, Canada, China, Hong Kong, Japan, Taiwan, United Kingdom and USA, cover a wide range of research on HRM, from the micro- to the macro-. Six of them teach and/or research at campuses on the Mainland. Their empirical, field-based research covers the last half-decade and presents a robust picture of both what practitioners have adopted and how researchers have tried to ‘make sense’ of what they have investigated. This book was based on a special issue of Intl Journal of Human Resource Management. Malcolm Warner is Professor and Fellow Emeritus, Wolfson College, Cambridge and Judge Business School, University of Cambridge. He was the Editor in Chief, of the International Encyclopedia of Business and Management [IEBM] latest edition, 8 vols, 2002. He is currently Co-Editor of the Asia Pacific Business Review.